The EarthScope Automated Receiver Survey (EARS. 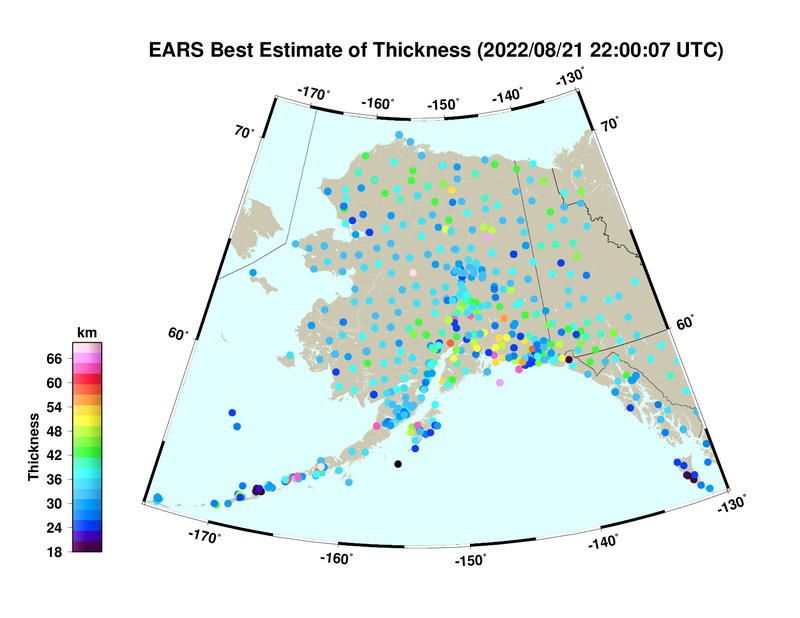 http://ears.iris.washington.edu) is a fully automated data product that queries the IRIS DMC Web Services in order to calculate bulk crustal properties of stations as new candidate data arrive (Note: prior to data day 2013-08-05, EARS was monitoring the USGS/NEIC weekly PDE (WHDF) catalog for new events). Through its processing sequence, EARS calculates the receiver functions and transforms them from the amplitude-time domain to amplitude as a function of crustal thickness, H, and the Vp/Vs ratio, K, using the predicted travel times of the Ps, PpPs and PsPs/PpPs phases over a suite of single-layer models. The calculated H and K values are then weighted based on the instantaneous phase of the receiver functions and an HK stack is formed for the station to allow estimation of its crustal thickness and Vp/Vs values (see figure). Due to its dynamic nature, EARS coverage of the continental US is extending to the east as the Transportable Array (TA) component of the USArray is rolling eastward (see the current map) and new station data become available at the IRIS DMC. 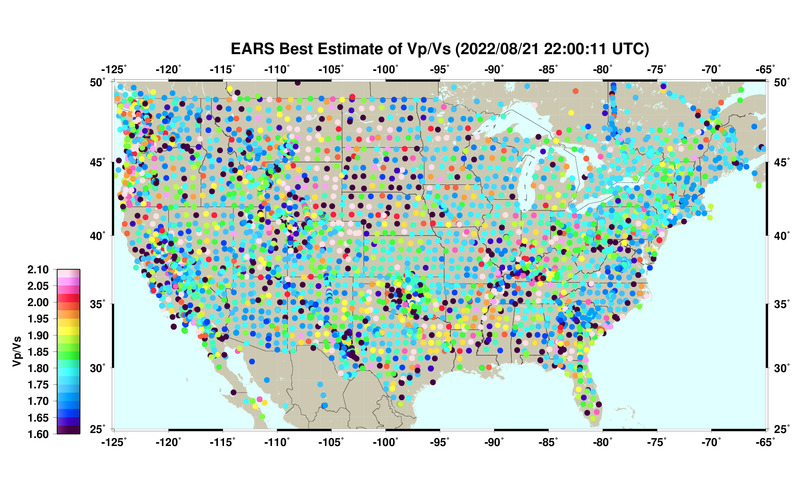 Maps below show the latest EARS crustal thickness and Vp/Vs coverage of the continental US. Additional details of the processing model used within EARS can be found in chapter 4 of Philip Crotwell’s dissertation. 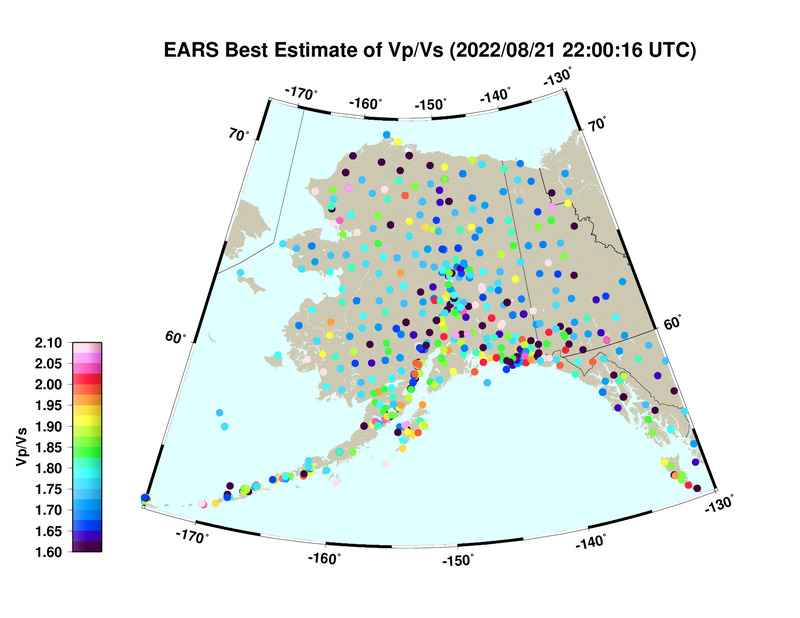 The following maps show some of the latest results obtained by EARS for the Transportable Array (TA) component of the USArray. Use the EARS web interface (http://ears.iris.washington.edu) to download the event-based or station-based receiver functions. To download receiver functions for multiple stations and/or events, use the helper Python scripts (the usage instructions are included). The downloaded EARS receiver functions, after a format conversion, could be further processed by FuncLab, a MATLAB interactive receiver function toolbox developed by Kevin C. Eagar and Matthew J. Fouch of Arizona State University. For a shell script to convert EARS data to FuncLab format and to download FuncLab, visit http://geophysics.asu.edu/funclab. IRIS DMC (2010), Data Services Products: EARS EarthScope Automated Receiver Survey, https://doi.org/10.17611/DP/EARS.1. Crotwell, H. P., and T. J. Owens (2005), Automated receiver function processing, Seism. Res. Lett., 76, 702-708. 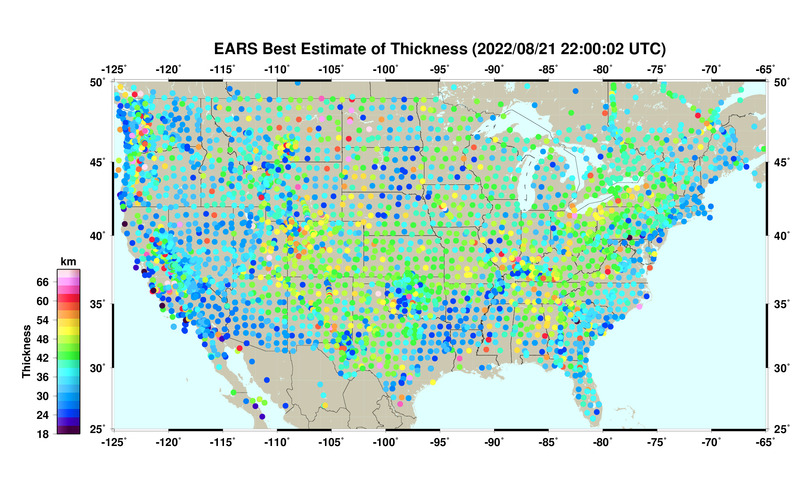 EARS was developed as an EarthScope/USArray data product by H. Philip Crotwell and Thomas J. Owens of University of South Carolina with an initial goal of estimating the crustal thickness and Vp/Vs ratio across the continental United States, using the IRIS DMC waveform archive. After its initial successful implementation at the University of South Carolina and because of its high level of automation, its scope was expanded to cover all stations in the extensive waveform archive of the IRIS DMC. The EARS database now contains over 250,000 receiver functions and H-K values for over 2500 stations from 133 networks around the world. In response to the DMC Data Handling Interface (DHI) deprecation plan for 2013, on 2013-09-04 a new EARS, utilizing DMC web services, came online. The events processed by this system are now from the NEIC PDE/NEIC PDE-W catalogs and include HH & Z,1,2 channels in addition to the Z,N,E seismic channels. In April 2010, EARS was moved to IRIS DMC and became an IRIS DMC data product and continues to monitor the weekly PDE (WHDF) catalog and station database for candidate data that can contribute to calculation of the bulk crustal properties of stations.